Seattle is the most famous of the Pacific Northwest Cities. It’s known for its music scene, the home of Nirvana, and rainy days. More people in Seattle can read than in any other city in the United States. Seattle holds more library card holders than any other city in the United States. The Space Needle was built in 1962 for the Seattle World’s Fair; it was the tallest building west of the Mississippi River at that time. In 1966, Microsoft co-founder Bill Gates won a contest at the Space Needle for perfectly reciting the Sermon on the Mount by Jesus Christ (chapters 5, 6 and 7). The very first Beatles song was played on a Seattle radio station. Seattle residents love dogs and they love to ride bikes. They often use bikes to commute to work, and according to a U.S. Census done in 2010, Seattle has more dogs than kids. Seattle is home to the National Football League team Seattle Seahawks, owned by Microsoft co-founder Paul Allen. They play at the CenturyLink Field, and won the Super Bowl in 2014. The Boeing Company, founded in the Seattle area by William Boeing, was originally a boat company. Medina is the home of the United States’ wealthiest man, Bill Gates, co-founder, former CEO and chairman of Microsoft. Cert-A-Roof offers roof inspection and roof certification in a 30 mile radius around Seattle, including the cities of Mercer Island, Bellevue, White Center, Kirkland, Burien, Newcastle, Tukwila, Renton, Shoreline, SeaTac, Lake Forest Park, Redmond, Kingsgate, Kenmore, and Sammamish, WA. Seattle’s climate may be wet, but it is also mild. Because of this, there are a variety of roofing options available for residents, including asphalt & asphalt fiberglass shingles, wood shingles and shakes, clay and concrete tile roofing, rubber roofing, composite roofing, metal roofing, corrugated roofing, and flat roofing. Although these roofs are extremely durable, they need to be inspected at a minimum of every 2 years because the asphalt, shingles, shakes or tiles can crack, break, or slip from its proper position. Other conditions that can affect the roof in Seattle are the winter storms, snow and high winds. While Providence, RI actually gets more rain than Seattle, what makes Seattle so wet is that the city has more rainy days. While it certainly pours cats and dogs in Seattle, most rainy days feature a light mist. 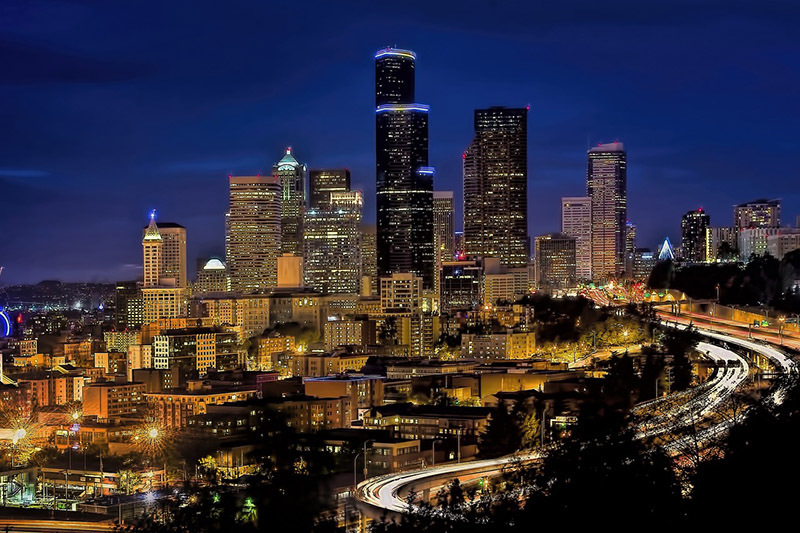 Whether visiting Seattle or moving to this vibrant city, you can expect a mild oceanic climate with cool, wet winters and mostly sunny, dry summers. According to a 2010 census, the Seattle population is 608,660 and continues to grow at a slow, by healthy rate. The average number of people per household is 2.06. This number has been declining because of growing number of one person households in Seattle. Does that make Seattle a city of singles? You will find a total of 308,515 housing units in Seattle with 48.1 percent owner occupied and 51.9 percent renter occupied. The average household size in owner-occupied units is 2.31 persons. As of 2016, Seattle ranked #1 for property remaining on the market the shortest time from listing to sold. There is so much to do in Seattle year round. The Puget Sound water front houses Pike Place Market, a public market that has been around since 1907, a ferris wheel, an aquarium, lots of restaurants and shopping, and Spider-Man. Seriously, he lives in Seattle. The Space Needle is another popular attraction. Opera, ballet, live theater, Seattle has it all. Every month there is some yearly event or festival taking place. In February there is the Seattle Asian American Film Festival, in April there is the Seattle World Rhythm Festival, and in May you celebrate Polish roots at the Seattle Pierogi Fest. We also offer LeakFREE® roof certification so you can feel confident in the repairs and services provided. Let us be your trusted Seattle roofer. Our roofing technicians are certified and able to provide you with professional repairs and services that you need to keep your structure safe and protected from the harsh Washington weather and elements. Seattle is home to many residents and businesses and is continuing to grow. When you notice an issue or problem with your roof, you should never wait to take action. You need to call on our authorized team at Cert-A-Roof right away. Taking the time to look for issues, such as leaks, missing shingles or other damage will help to ensure that you take action in a timely manner. There is no question that there are more than a few roofing companies to choose from in the Seattle area. However, our team is licensed and insured to ensure superior repair and service regardless of what your roofing needs may be. Don’t trust your roof in the hands of just anyone when we offer superior repairs, in a timely manner and for an affordable rate. We have over 50 five-star reviews on Yelp, and have conducted over 50,000 roof inspections. When you are ready for any type of roofing services, call on us and our team. We are ready to provide you with prompt repairs or maintenance that you need.